100 people line up to take their seats in a 100 seat theater. The 1st person in line lost her ticket and so sits in a seat at random. Each remaining theatergoer sits in their assigned seat unless it’s occupied, in which case they sit in a seat at random. What’s the probability that the last person in line sits in their assigned seat? First, approaching these sorts of problems is almost always easier when they’re phrased in terms of counting things rather than probabilities. So what are we counting here? The number of ways to fill the seats so that the last remaining seat is the last person’s assigned seat. The number of ways to fill the seats so that the last remaining seat is not the last person’s assigned seat. The relative frequencies of each of the previous outcomes. Since the last remaining seat is either the last person’s assigned seat or not, (1) + (2) = the total number of ways to fill the seats. The number of combinations in which persons A through n-1 can choose a particular seat determines its relative frequency — e.g. 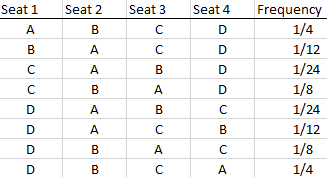 if there are 3-seats, person A ends up in each seat 1/3rd of the time, but since they can end up in seat 2 in two different ways, person B’s choices then split those odds. 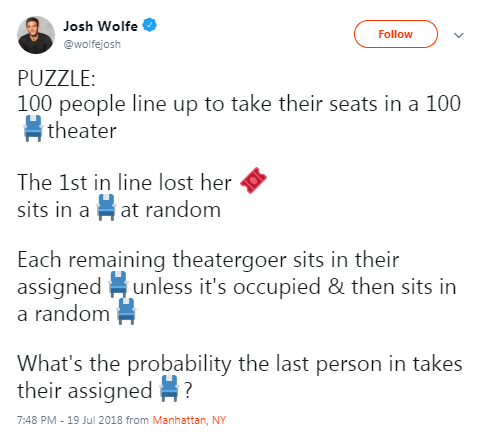 Then summing over (3) for the last person’s correct seat assignment is the probability that the last person is in their correct seat. It’s easy to see that the probability of person B sitting in their assigned seat is then (1/2). And again, the probability of person C sitting in their assigned seat is (1/3) + (1/6) = (1/2). Each of the things we’re counting in (1) and (2) are then equal and grow at the same rate. Thus, the probability is the same no matter what n we choose. This exercise reminded me of some examples in Thomas Schelling’s Micromotives and Macrobehavior where there’s non-obvious, invariant aspects to different types of counting problems. I’m out of town now but I’ll update this with some specifics later. edit: It’s March 2019 and I did not update this post with some specifics later. If that ever happens, I’ll make a big deal out of it. Thanks to Jamie Pastore for just being Miley. This post originally appeared on Zachary David’s Market Fails & Computational Gibberish.